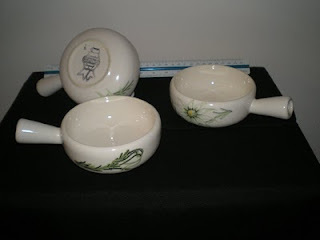 Decorated with wildflowers (flannel flowers) on the sides, earthenware, slip-cast, each have circular bowls with low rounded sides and are semi gloss white glazed, each has a hollow conical handle tapering towards the bowl. Willow Court Antiques, New Norfolk Tasmania. Young Eric was quite entrepreneurial in his late teens as he began importing cut glass and crockery from Germany and Czechoslovakia. Timing was not on his side as this began in 1939. This company was called “Eric C Lowe Pty Ltd.” “Maunufacturers of Utility and Fancy Earthenware”.